Our “trade tensions” playbook in today’s Weekly Market Commentary. Hardly news to anyone at this point, escalating trade tensions have made for a difficult investing environment. But investors’ angst was ratcheted higher last week after the Trump Administration played its next card–an additional $200 billion in tariffs announced on Chinese goods–sooner than many expected, and media reports suggest that the next salvo from the White House will be to restrict Chinese investment in certain U.S. technology companies and enhance export controls to prevent “industrially significant technology” from becoming available to China. Certainly, the stock market expressed displeasure, though the 0.9% drop in the S&P 500 Index for the week still leaves the index with a respectable 4% return year to date; while trade measures enacted–or likely to be enacted–are likely already taking a small bite out of the U.S. fiscal stimulus, and there is increasing anecdotal evidence that some businesses are delaying investment until they have greater clarity on how trade disputes with China and other major trading partners resolve. In this week’s Weekly Market Commentary and Weekly Economic Commentary, we look at the impacts to businesses and the financial markets, and discuss how we’re playing it. The week ahead. Key data points and events to monitor in the U.S. this week include consumer confidence, personal spending and income data. Inflation reports headline the overseas docket with releases out of Germany, Italy, France, the Eurozone, and Japan. 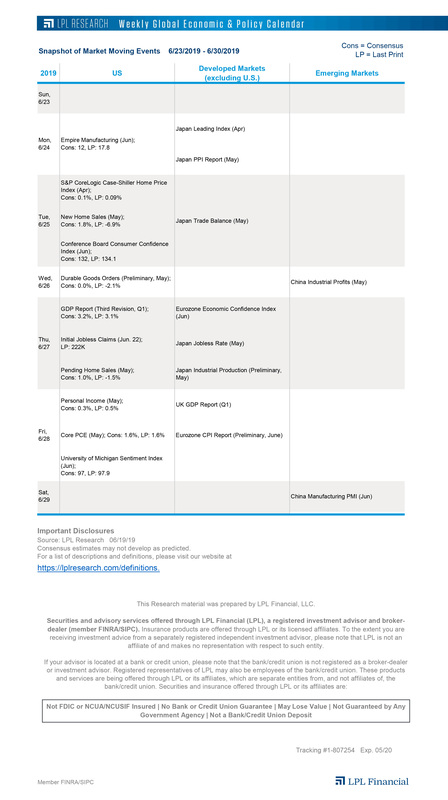 See all of the important economic data due out this week in our Weekly Economic Calendar.